Should any equipment break down at Bellerive CC, St. Louis or if there is a part needed that’s not already on-hand, it’ll be Bruce Kapp’s phone that rings. Learn more about the John Deere turf products distributor supplying the equipment to Bellerive CC. READ MORE. More player reactions from Wednesday morning at Bellerive CC Wednesday morning we got a chance to talk to Adam Scott, Dustin Johnson, Jim Furyk and Zach Johnson as they came off the course. After Tuesday’s rain storms we wanted to see if the course was playing any different. READ MORE. Players talk Bellerive conditions Tuesday afternoon we got the chance to (finally) talk to some of the players about how they felt about the way Bellerive was playing… and yes, we also asked them about the condition of the greens. READ MORE. 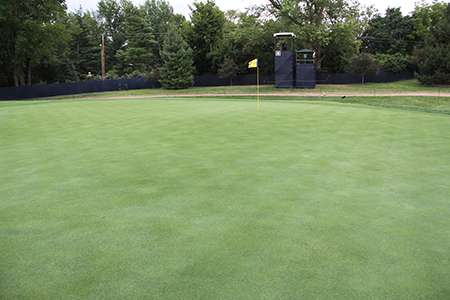 Following Golf Digest’s article that sent shock waves through the industry, Seth Jones shares his perspective on course conditions at Bellerive CC. READ MORE. 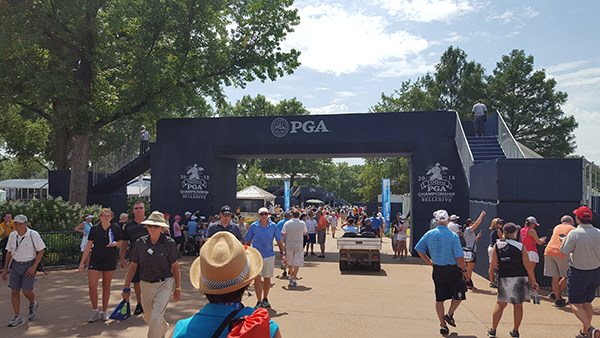 Almost 90 volunteers from around the country and around the world filled the maintenance hospitality tent on Sunday to hear from the man leading the maintenance efforts here at Bellerive CC in St. Louis. Read on a for a few of the highlights. READ MORE. More than turf: Making connections at Bellerive Talk to some of the volunteers from Bellerive last week and it’ll be no surprise that one of the main reasons they ventured to Missouri was for the networking. READ MORE. To honor their friend, three friends make the trip of a lifetime Isaih Arraya, the late son of Carlos Arraya, is only at the PGA Championship in spirit, but his three best friends are here in person to honor him and to support his father. READ MORE. We’re kicking off PGA Championship week with a contest to give away this John Deere-themed Grizzly cooler. Find out how you can put your name in the running. Who better to talk about Bellerive design and layout than Rees Jones? No one. Check out our interview with the famed architect (who also has strong family ties to this historic course) about some of the finer points of the layout, design and construction. Rees Jones Golf Course Design Senior Designer Bryce Swanson offers a closer look at the design of Bellerive Country Club, including how it has been made to accommodate professional players and its membership. This week at Bellerive Country Club viewers will notice a sea of green — beautiful greens, sharp greens and, oh yeah, a fleet of familiar green mowers with yellow accents. Volunteers came in from all around the world to help out Carlos Arraya and his crew for the 100th PGA Championship. We talked to a few to get their stories. 2018 PGA Championship preview: A superintendent for the people Learn more about the man leading the charge, Carlos Arraya, CGCS, his crew and what happened at the course to get it ready for the PGA Championship. READ MORE.